First, nose pics are weird. Second, I bet you don’t know that the nostril you breathe through impacts your brain function! (Although maybe you do remember that the right side of your brain controls the left side of your body, and vice versa… this is similar in concept, but we’re talking nostrils affecting brains here instead of brains affecting body parts!). The hypothalamus is basically the brain of the brain. The nasal cycle (inhale/exhale through nose) is controlled by the hypothalamus. Ultimately, when you breathe dominantly through your right nostril, it enhances your left brain activity and increases your verbal performance. When you breathe dominantly through your left nostril, your right brain activity is increased and you have enhanced spatial performance. You can use this on purpose easily, but let’s sum it up anyway and add essential oils! 1. Need to focus and be ready to work, present, or do other left brain things? Take a few minutes to do deep breathing. Partially or fully block (experiment to find out the effects) your left nostril while you do this. Bonus: Use orange and geranium essential oils. 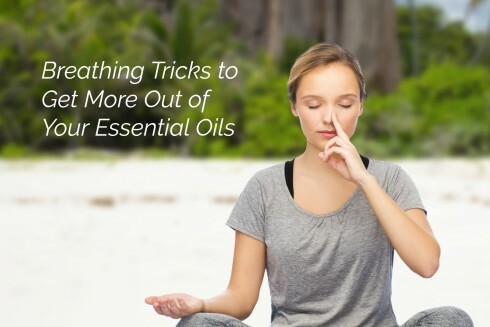 Diffuse them while you do this breathing exercise or add a drop to your palm while you do deep breaths with your palms cupped over your nose. (I prefer diffusing, but you can get a quicker “Fix” if you put it on your palm). 2. Need to be in a creative mindset or be more physically coordinated (maybe for dancing or yoga)? Do the same breathing exercise, but block the right nostril fully or partially while you breathe. Want more brain-and-oils info? Stick around! Side note: The brain is very complex… don’t try to diagnose things based on symptoms, but do join my Natural Wellness FB group to learn more! Bringing in multiple senses when you’re trying to balance your body is a great thing to do!